After much hesitation, many false starts and a good deal of experimentation, I finally completed the wiring in my model of Seattle & North Coast F7A No. 101. The decoder I used is an ESU LokSound Select. I chose an ESU decoder so that I would be able to program it myself as I find better sound files. The firmware can also be updated with an ESU programmer connected to a PC. I bought this decoder a couple of years ago, before the LokSound Select Direct (that’s a mouthful) was available. For the next two F units I’m building, I’ll probably use the Direct as it is a drop in replacement for the standard Athearn board. That should keep the wiring mess to a minimum. 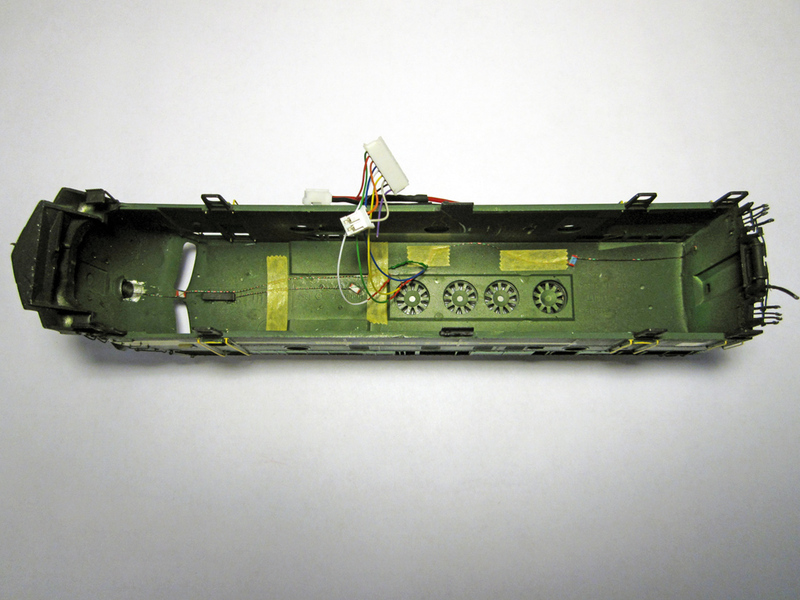 The speaker is whatever was included with the Athearn chassis (it came equipped for sound with an MRC decoder). I didn’t do a lot of research, just verified that it was indeed an 8 Ohm speaker and soldered it to the decoder. 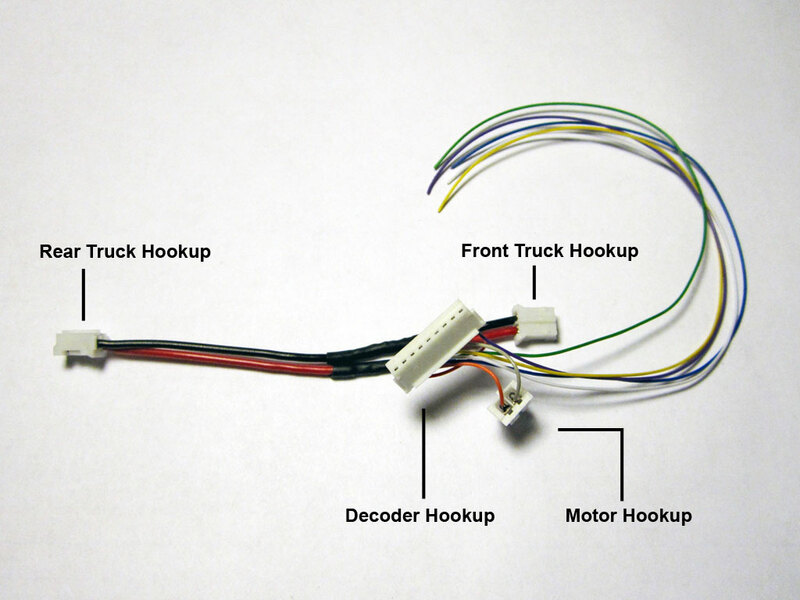 The wiring diagram for #101. The lights are surface mounted LED’s from Ngineering. 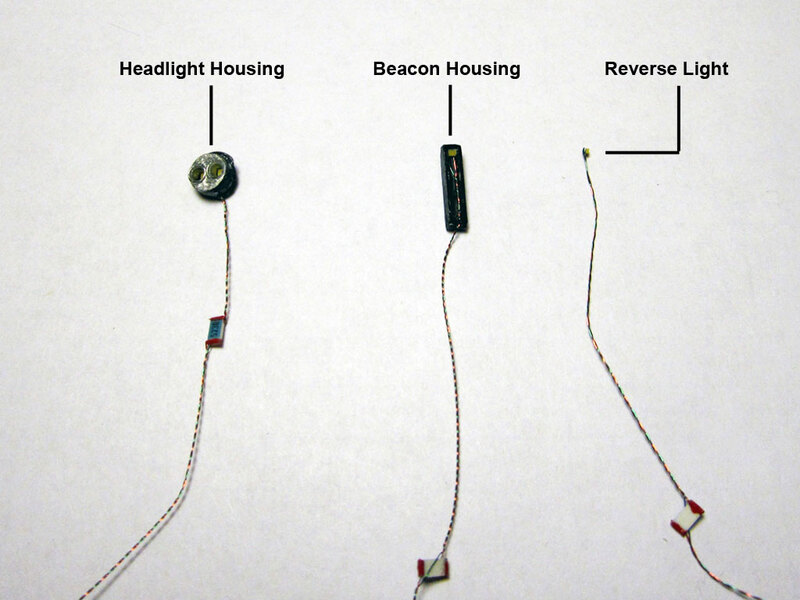 I used a pair of Micro Super-Incandescents in series for the headlight and individual Nano Super-Incandescents for the rooftop beacon and reverse light. No. 38 Magnet Wire leads were soldered, by yours truly, to the LED’s and a mini resistor (also available from Ngineering was added to the anode leads. 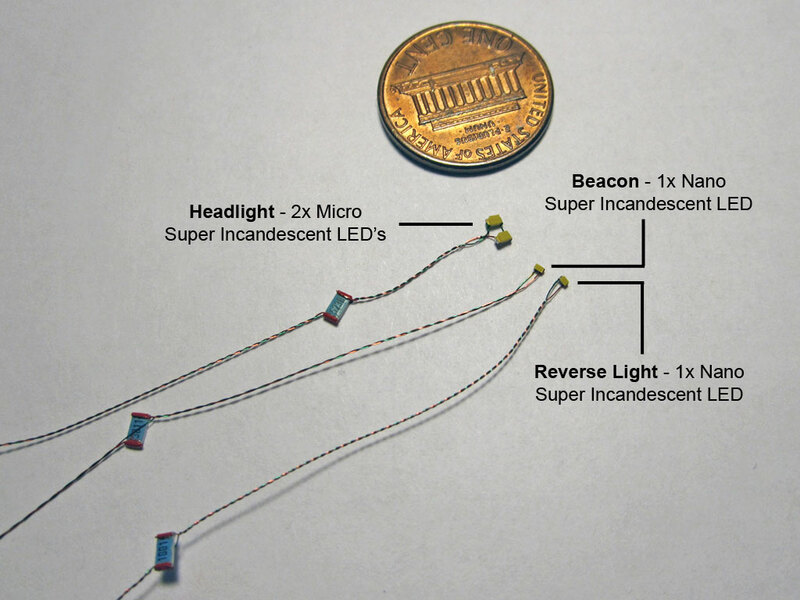 Micro and Nano sized Super Incandescent surface mount LED’s soldered to leads and resistors. Once all the lights had been tested I mounted the two headlight LED’s inside the Highliners headlight housing which I’d already painted silver on the front and black on the rear (I used this housing to determine how far apart the LED’s should be while I was soldering the leads). Once the LED’s had been installed and tested again (you can never test too many times) I cut a circle out of a piece of styrene sheet and attached it with super glue (I didn’t use plastic cement in case I ever need to change out the LED’s) to the rear of the housing. This assembly was painted black to keep any light from leaking and was then installed in the shell with just enough white glue to hold it in place (this was also done to allow easy removal). The LED’s mounted in their housings. For the beacon, I built a tiny baffle from strip styrene and painted it black. I mounted the LED inside it with white glue then attached this assembly to the top of the shell making sure to line up the LED with a pre-drilled hole that the Details West beacon sits in. Because space was tight at the rear of the unit, I did not attempt to baffle the LED for that location, I simply attached it to the shell with white glue pointing out through the hole drilled for the DW casting that I used for a housing. The wires were then trimmed to an appropriate length (so as to be out of the way but still allow the shell to be removed from the frame) and were soldered to the LokSound harness. The wiring diagram at the end of this post gives a pretty good idea as to how everything was connected. 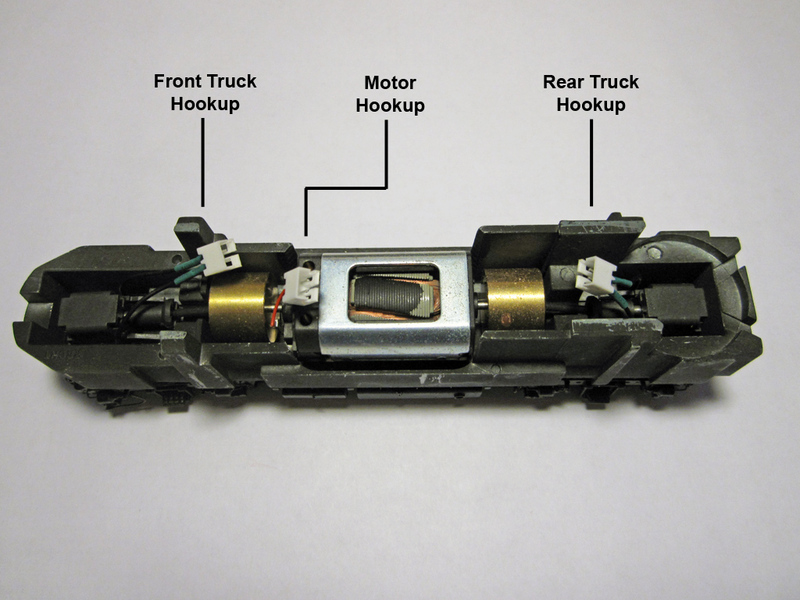 Motor and truck leads with connectors attached. For the trucks and motor I attached the male end of some Mini Electrical Connectors from Micro Mark to the leads, insulating them with miniature heat shrink tubing. I then attached their female counterparts to the LokSound harness. Now, if this unit needs to be disassembled (god forbid), I can do so without having to un-solder anything. While the connectors and heat shrink tubing I used were decent, they’re pretty clunky. If anyone knows a source for something smaller, I’m all ears. At the moment I’m at something of a crossroads. Do I attach the glazing and grill and fully re-assemble the model before weathering, or should I weather first, then attach the last pieces and assemble. Ideally I think I’d like to get the thing put together, but I’m wondering how difficult that will make weathering. I would obviously need to mask over all windows, and I do have some liquid mask for that, but I’m not sure how well it works. I also feel like it would allow for more continuity in the weathering… Anyway, suggestions are very welcome. That’s it for now. I updated the theme for the blog, hope you like it. Photo’s should get larger, and, now that WordPress has a decent way to create galleries I’ll probably do away with Pbase.